1.5 Who is recommended to take pollen? 1.12 Pollen to treat allergy to pollen? 1.13 How to consume bee pollen? Pollen is a natural supplement that is obtained from bees. Bees collect pollen from the plants and transport it to their honeycomb in the form of granules, which they make themselves. The granules, orange, yellow, green or brown, are formed by bees from the pollen and nectar of the plants. Through a special process, pollen is collected at the entrance of the hive. Pollen improves the vital conditions of the body (restorative). The revitalizing properties of pollen were discovered in 1946 by Russian professor N. Tystin. This researcher realized that most of the participants in the study were over 100 years of age and almost all of them worked as beekeepers, so they consumed pollen and honey daily. Numerous subsequent studies have concluded that after a few days of taking pollen, the body feels more vigorous, stronger and with a stronger vital desire. The reason for this property is its balanced content in carbohydrates, its richness in proteins (contains 22 essential amino acids), enzymes (especially amylase and invertase, in addition to phosphatase, pepsin, trypsin and lipase) and phytosterols. It also provides vitamin B (even small amounts of vitamin B12), vitamin C, vitamin E and other antioxidants, such as rutin, quercetin, selenium and beta-carotenes. Who is recommended to take pollen? Although pollen is very suitable for all people, except for those who have allergy to pollen, it is especially indicated in cases of convalescence or to prevent the appearance of diseases by endowing the body with greater resistance against them. It is equally ideal when you have low mood, decay, or when we are tired. People with anorexia can increase their desire to eat food after taking pollen for a few days. With this they can regain weight and find themselves better. Students, tired or weak, physically or mentally, can renew their strength, their desire to study or their lack of memory. Workers who make great physical efforts, athletes, hikers, housewives, etc., can take advantage of their energizing and revitalizing properties to better withstand daily stress. Those who suffer from stress, nervousness, usually feel irritated or depressed or experience an autumn-winter depression or postpartum depression may improve their condition with the use of pollen. Pollen does not represent the antidote to eternal youth, although it can improve the conditions of the elderly. By having a rejuvenating effect on the cells of the body, it can delay the symptoms of aging. In the same way, it has a restorative and remineralizing effect for children, as well as for pregnant or nursing women, both for the mothers themselves and for the fetus or future babies. The ability of pollen to regulate the functioning of the digestive system has been widely recognized. Pollen not only has digestive properties so it helps fight bad digestion but is able to control both diarrhea and constipation. 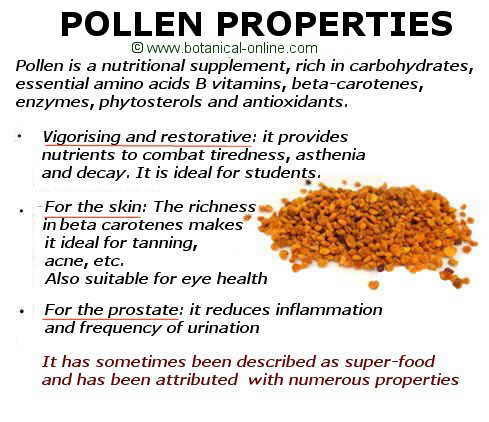 Pollen has bactericidal and anti-inflammatory properties. The former may be able to eliminate or inhibit the development of numerous bacteria responsible for intestinal putrefactions that cause many intestinal problems, such as bellyache, flatulence, diarrhea, etc. On the other hand, its anti-inflammatory properties help to diminish swelling and reduce the discomfort that these anomalies entail. The laxative properties of pollen come mainly from its fructose richness. Its richness in enzymes helps to digest the food better favoring the work of the liver so it will be indicated in cases of liver weakness or failure. The antibacterial and anti-inflammatory properties of pollen can be used to improve symptoms related to respiratory problems, such as colds, flu, sorethroat, COPD, etc. The eyes are organs that are especially affected by cellular oxidation. Vision problems, as we get older, are increased by both, bad eye habits and by the action of free radicals that affect the cells of the organs of sight. The antioxidant capacity of bee pollen, together with zinc and vitamin C make pollen a good supplement to improve vision and prevent the onset of eye fatigue or other eye diseases such as macular degeneration, night blindness, the falls, etc. The internal use of bee pollen improves skin conditions. After a few days of taking it, skin looks thinner and smoother. It is useful for decreasing acne, wrinkles or excessive fat. Bee pollen enters the composition of numerous creams and diets for skin care. A cure of pear juice or a cure of strawberries can include this supplement to promote metabolism. It is also highly recommended for people with psoriasis, lupus and eczemas. Pollen can also be part of the detoxifying diets that bring so much health to the skin and the body in general. The richness in zinc and its vitamin E content are especially interesting for the treatment of prostate problems, as it manages to reduce inflammation and frequency of urination. Zinc inhibits the production of dihydrotestosterone whose elevated levels are related to non-cancerous enlargement of the prostate. An increase in zinc in prostate cells appears to be effective in the prevention and treatment of benign prostatic hyperplasia. Vitamin E, among many other properties, in addition to anti-inflammatory properties, very suitable to prevent inflammation of the prostate, has antitumor properties capable of inhibiting the growth of cancer cells, especially in breast, colon and prostate cancer. On the other hand, pollen can help improve some problems of the male genital tract. It is especially useful in cases of lack of sexual desire or impotence. Pollen is especially indicated in cases of anemia. Its ability to increase the production of red blood cells can help resolve the negative symptoms of this disease by helping patients regain their strength and feel better. It can also be useful in cases where there is a habitual loss of blood, as it happens in people who usually bleed through the nose or women with heavy menstruation. Pollen to treat allergy to pollen? Some therapists have indicated the use of pollen for the treatment of spring allergy symptoms. Since this allergy occurs precisely because of allergy to pollen, it seems a contradiction to take the same product that causes the allergic reaction. Proponents of this theory argue that minimum doses of pollen, especially selected from certain plants, could act as desensitizers for people with allergy to pollen. That is, as with vaccines, taking small amounts of pollen can prepare someone to be more resistant so as to react better if he/she comes to be in contact with allergenic pollen. However, most therapists believe that it is too dangerous to use this method because a small amount of allergenic pollen could easily mix with the pollen used for this type of therapy. In addition, possible adverse effects can be serious, since in hypersensitive people, a small amount can trigger very serious allergic reactions. Given this probability, it is better to adopt other types of natural remedies for spring allergy. How to consume bee pollen? 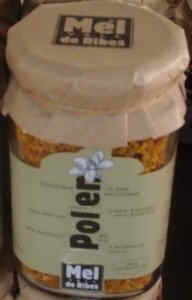 The most common is to buy bee pollen in supermarkets or natural food stores in granulated form. It is also found in the composition of some breakfast powders, mixed with cocoa, breakfast cereals or brewer’s yeast. You can take 1 to 3 teaspoons a day, mixed with milk, infusion or in yogurt. It is best to take it at breakfast as it is an energetic and invigorating supplement, although you can take it at night if there are no insomnia problems. 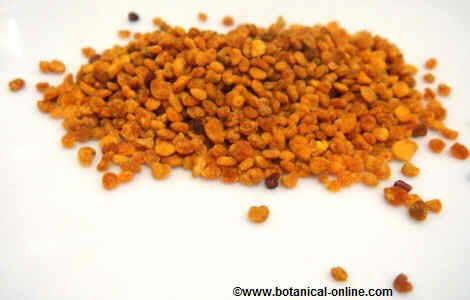 We can also buy bee pollen in the form of pills, capsules or tablets. – Allergies: people who have asthma, allergies to pollen or who are allergic to bee stings should avoid eating pollen. – Start small doses: people who have never ingested bee pollen should do so in small quantities at first, at least the first 2 days. In this way, a possible serious allergic reaction could be avoided. In case of itching of the throat, tingling or swelling of the tongue, redness of the skin or breathing problems, stop taking and consult with the doctor immediately the appearance of allergic symptoms. More information on pollen, honey and other bee products.